KHJ Los Angeles had an important place in the history of West Coast Radio but eventually ran into hard times as TV became the preferred media for sponsors. The station first took to the air on April 13, 1922. Later that year, the station was bought by the Times Mirror Company, the parent company of the LA Times, and eventually gained affiliation with the Columbia Broadcasting Company after being purchased by auto dealer Don Lee. The station became CBS's West Coast hub and in 1931 was the originating studio for Bing Crosby's first nation-wide program. When CBS moved to their new West Coast flagship station, 50,000-watt KNX, KHJ and the rest of the Don Lee Network joined with Mutual to become the Don Lee-Mutual network, with affiliates up and down the West coast. In November 1949, the station had programming problems again. There were no Mutual programs that really fit the late morning time-slot, so the decision was made to create an hour and a half disc jockey show that would begin in the bottom of the nine o'clock hour titled The Nine Thirty Club. The heart of any disc jockey show is the DJ, of course, and over the course of several days in midmonth three different talents were given on-air auditions, Merrill Ross, Bob Moon, and Gene Baker. The listening audience was encouraged to send postcards to the station stating their preference. Each postcard would then be entered into a drawing for an $800 television console (enclosed in the attractive wooden cabinet were an AM/FM radio, turntable with a record player, and a 16-inch TV screen). The eventual winner, Gene Baker, was to announce the winner of the drawing on the Friday after Thanksgiving. During the audition broadcasts, the sponsor was a toy company in Hollywood offering five large inflatable vinyl circus animals. We may suppose that the offer, while serious ("five large inflatable circus animals for one dollar, not one dollar each but one dollar for all five!") was also part of the audition process, the spokesman who could make obviously cheap toys sound attractive having a leg-up on his competition. 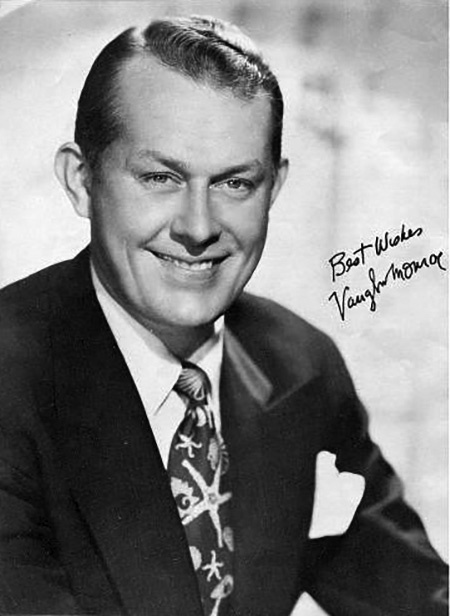 The show featured music from Vaugh Monroe, Dinah Shore, The Andrews Sisters, Frank Duvall, Benny Strong, and others. Once The Nine Thirty Club began in earnest, Cavalier Cigarettes picked up the sponsorship, and Gene's guest on Thanksgiving was Jack Bailey from Queen for a Day. Be the first to comment on "Club 930"